Duck is one of the greatest foods ever and a good duck breast recipe can bring out its rich and complex flavors. Because ducks are more active than chickens, the flesh of the duck is a little tougher than that of the chicken. But, this same activity gives duck meat a richer, deeper, more complex flavor. This means that more care needs to be used in your recipe so the meat becomes tender. A good duck breast recipe will give you a great tasting meal. I personally believe that if more people would give duck a try, they would love it. I understand that duck takes a bit more work than chicken and it is a bit more fatty than chicken, but that fat gives duck its flavor and the extra work is always worth it when the food tastes so good. As we go through this duck breast recipe, you will notice that I constantly ask you to save the fat or the juice. This is because duck fat is a great flavor enhancer. If it weren't so expensive, I would use duck fat in everything. For this recipe, we will be using some of the duck fat, ancho chilies, and caramel. The combination of sweet and hot will exemplify the richness of the duck. Toast chilies in a small, dry, heavy skillet over moderate heat until slightly darker, turning once with tongs, for about 40 seconds total. Transfer to a small heatproof bowl, add boiling water, and soak until softened, about 20 minutes. With a slotted spoon, transfer the chilies to a blender. Add 1 cup soaking liquid and garlic and blend until smooth. Cook sugar and 1/2 cup of water in a 1 1/2-quart heavy saucepan over medium heat, undisturbed, until it begins to caramelize. Continue to cook until sugar has melted to a deep golden caramel, about 8 minutes. Carefully add orange and lime juices. The juices will react with the caramel and will steam and bubble violently, so use caution here. Cook while stirring over moderately low heat until hardened caramel is dissolved, about 5 minutes. With a sharp paring knife, score skin through fat on each duck breast in a crosshatch pattern, making score marks about 1 inch apart. Pat dry and sprinkle with salt and pepper. Put 3 breast halves skin-sides-down in a 12-inch heavy skillet. I like to use my cast iron for this because it holds heat well and has a tight fitting lid. As fat is rendered, pour it into a heatproof bowl and reserve for another use. Cook breasts until skin is well browned, about 10 minutes. Turn over with tongs and cook until meat is browned, about 3 minutes. Transfer to a plate and brown remaining 3 breast halves in same manner. Return all breast halves to skillet, cover, and cook over medium heat until thermometer inserted horizontally into center of a breast registers 135°F for medium-rare, about 6 minutes. Transfer duck to a carving board and let stand, uncovered, while you make sauce. Pour off all but 2 tablespoons fat from skillet. Add chili purée and any duck juices from plate and cook over moderately high heat, stirring and scraping up any brown bits until thickened, about 6 minutes. Add caramel and any juices accumulated on carving board and simmer for 5 minutes more. Whisk in butter until incorporated, then whisk in salt to taste. 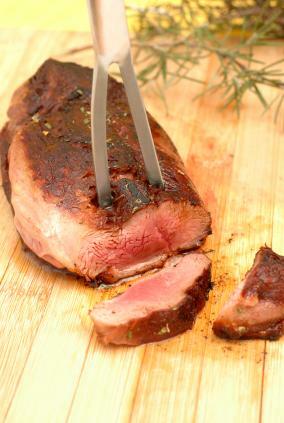 Slice duck breasts and serve with sauce. I like to serve this with Pommes Anna, made with duck fat rather than butter, and sautéed asparagus.